Harmony Central Review - "It’s crucial to note the RP2000 doesn’t have distortion or overdrive, per se. If you want dirt, you need to choose a model. To get dirt, choose from among emulations of amps like blackface and tweed Fenders, Mesa Boogie and Dual Rectifiers, Vox and Matchless-type Class A amps, and of course a Marshall JCM900. Once you pick a model, you can adjust the distortion level accordingly. Some models offer tons of saturation, others only offer a hint of edge. ... these are good solid guitar tones. They are usable tones in studio applications. They sound great at bedroom levels and at club gigs (I tried mine at a gig). They sound just as good or better than my pedals (including my TS9, which I swear by). However, I own a Matchless amp. I own a blackface Fender. I have had the pleasure of cranking them up until the power amps saturate. These models DO NOT sound exactly the same. The RP2000 tones sound more like a nice recording of the real thing. They are slightly processed, more refined but with fewer textures to the sound... but they do sound good. Also in their favor, they have a beefier bottom end and a smoothed-out high end, making them very easy on the ears, especially on stage. They also cut through a mix nicely. Also in favor of the RP2000, it’s difficult to crank my Matchless in a studio and capture that massive sound on tape. 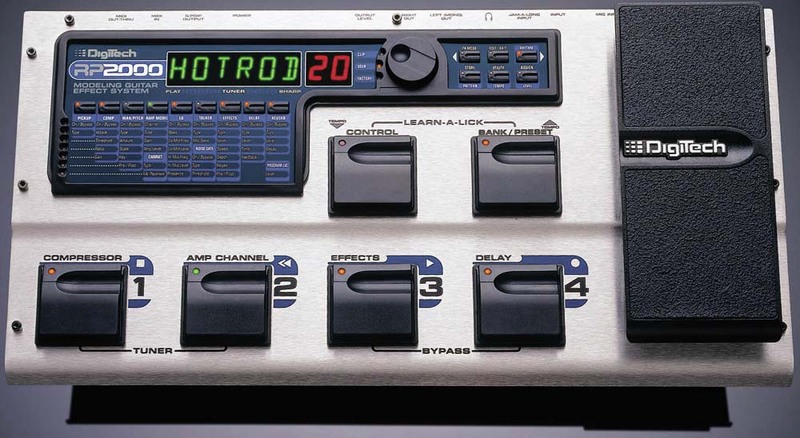 With the Digitech, it’s plug direct into the board and play. Speaking of direct recording, the RP2000 offers a variety of speaker cabinet simulation models." Learn-a-lick feature - the footswitches control record, stop, play, rewind. Recording up to ten seconds from your CD or tape player, the passage is stored in the unit as a sample, allowing you to play the passage repeatedly, at full, 7/8, 3/4, 5/8, 1/2 and 1/4 speed without change of pitch. Rhythm mode - built-in drum machine with a selection of common rock, blues, pop, swing, jazz etc. beats. 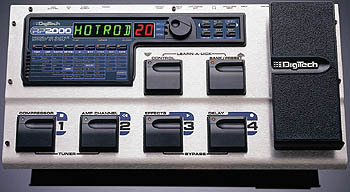 The second pedal switches between amp “channels.” Each preset has two “channels” available; red and green. You could program one to be your lead tone while using the other for crunch or clean. cabinet modeling parameters are in the same bank of parameters as amp model parameters. Oddly, the choices aren’t things like “open back 2x12” or “closed back 4x12.” Instead they are “Dark,” “Warm” and “Bright.” You can also choose between 10 virtual “mic placements” ranging from the center of the virtual cone to the edge of the cone. A cabinet model can be programmed into an individual user preset. However, a particularly studio friendly feature is the ability to globally assign a cabinet model to all user presets and factory presets. The direct signal is good for recording (as you can judge by the sound samples). However, I believe the RP2000 sounds best when used in conjunction with a tube amp. 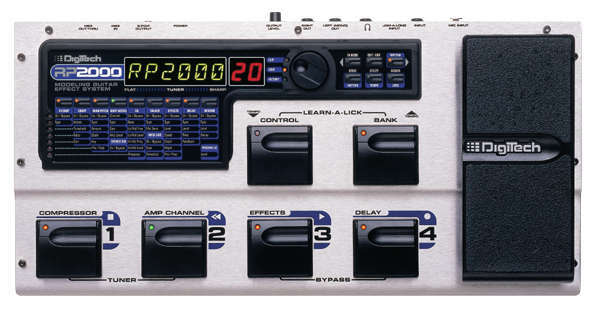 musiciansbuy.com: Digitech RP2000 Amp Modeling Effects Processor - "modern technology colliding with vintage tonality. Beneath the sleek exterior of the stainless steel chassis lies the versatility of authentic amp modeling, pickup modeling, acoustic modeling, and a cornucopia of the best effects that a processing giant like DigiTech has to offer. Not only will the RP2000 take you to new levels of tone with ease, but you’ll reach new levels of skill with learning tools like Learn-A-Lick™, and Rhythm Trainer. And you can transfer your new experience to tape without losing a “bit” through the Digital Output."